Healthy to the core, this bean sprout salad (more popularly known as mung bean sprouts), is loaded with vitamins A, B, C, and E. Also, minerals including Calcium, Iron, and Potassium. Mung bean or moong bean (dal) is considered the best legume in Northern India. The reason being that Unlike most beans, mung beans contain very few oligosaccharides, the sugars responsible for flatulence. Hence they are good for anyone suffering from digestive problems. When you sprout the mung bean, it attains an additional level of nutrition - vitamin C. Mung beans sprouts have no cholesterol and are low in calories. One cup of mung bean sprouts contains only approximately 30 calories. Fact - The consumption of 4 or more servings/week of beans, decreased heart disease by 22% according to a US study of nearly 10,000 people. Mung bean sprouts can be easily made at home, although they will never match the commercially produced bean sprouts. They are healthy, nevertheless. This salad is apt for you if you are on a diet or just want a light meal. I like it because it is such a tasty excuse to eat healthy food. Another positive thing about this salad is the preperation time, which is like 5 minutes. Mix all the dressing ingredients in a small jar with a lid and shake vigorously, alternately put them in a mug and whisk them with a fork or a small balloon whisk until combined. Sneak a taste and adjust the quantities of any ingredient if necessary. Place the rest of the ingredients in a salad bowl and pour this dressing on top. Toss well. 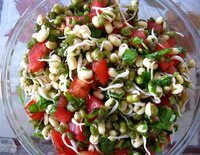 Serve chilled and enjoy your heart healthy bean sprout salad.